As the temperatures cool off for the year, it’s the perfect time to truly enjoy your outdoor oasis. Sure, you may not be swimming as much as you do in summer, but there’s no reason to completely avoid the outdoors. Cool-weather entertaining and relaxing can be enjoyed by anyone, and with these top fall trends, Elite Pools & Spas can help any homeowner bring their inspiration and backyard dreams to life. Installing a fireplace or fire pit in your backyard space creates the perfect gathering spot for family and friends to enjoy. There’s nothing quite like sitting by the roaring fire with a nightcap, topping off a crisp fall day. Making a fireplace or fire pit a permanent place in your outdoor living décor allows you to not only extend the life of your outdoor space, it also creates a complementary area that enhances your pool design. When you take advantage of the cooling temperatures and recognize they aren’t going anywhere, you can create a space that becomes the go-to spot for entertaining. Many outdoor living spaces lack quality seating areas. Consider defining a certain area in your outdoor living space that is designated for extra seating, and incorporate built-in seating walls that blend well with your outdoor aesthetic. Once those seat walls are built, you can dress them up with different textiles that complement the season. Between soft throw pillows and blankets and stylish ottomans, get ready to see your space completely transformed. Yes, fall and winter landscape tends to thin as the weather cools, but have you ever considered planting flowers, grasses, bushes or trees that bloom and thrive during the cooler months? Fall perennials can give your outdoor living space life during a time where many assume it’s supposed to look drab. Liven up the greenery, and welcome friends and family with an area that stays lush year round. Maximize your outdoor living space by incorporating an area where you can cook outdoors. Grill islands, brick ovens and larger outdoor kitchen areas are wonderful options for dining al fresco. These sturdy structures can withstand the changing temperatures while you cook deliciously tasty, and warm, food, that can be enjoyed outside in the chillier temperatures, whether fireside or in your outdoor seating area. 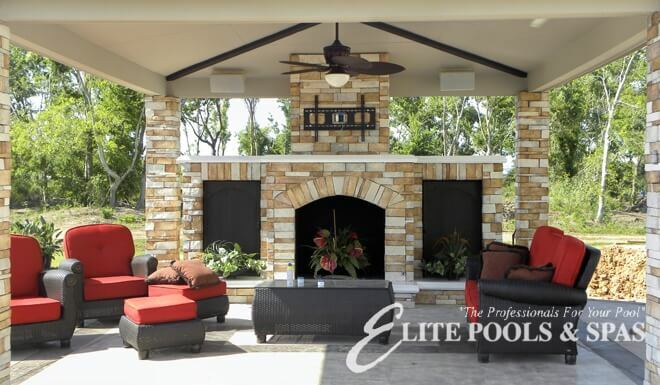 Learn more about how Elite Pools & Spas can create a custom outdoor space for you by contacting us today. For over 20 years, Elite Pools & Spas have been providing new pool construction, pool remodels, pool repair and weekly maintenance services for Houston, League City, Pearland, Clear Lake and the surrounding areas.